I was driving around tonight while trying to decide where to eat when I received a text message from a friend asking why I haven't posted a Halloween nail design I wore during her birthday celebration. Well, one reason was that I was away last weekend and partly because my Skulls Skittles surprised me with many of you appreciating it so I decided to let it stay on top for awhile. But I couldn't disappoint a friend and her request to see this here already. 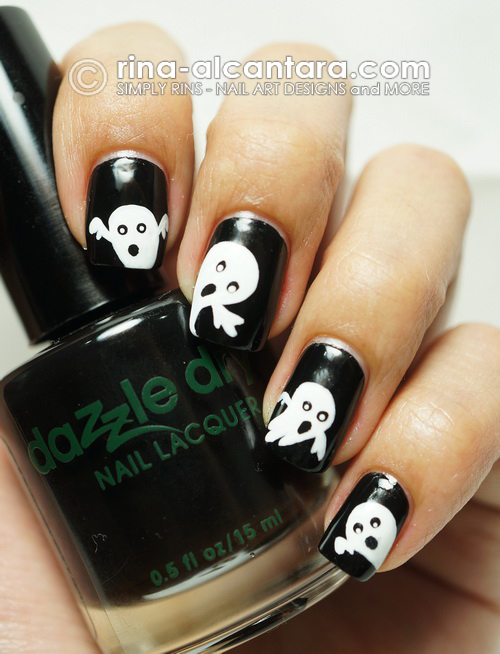 So, without further ado, here's my 5th installment to this year's Halloween nail art ideas. I named this Not So Spooky Ghosts. I think everything about this design is simple. The colors and the design itself. I have given up to the idea of coming up with a scary nail art for Halloween ... well, at least for 2012. There's still hope for next year, right? I used Dazzle Dry Midnight Express, a pure black polish with an amazing consistency and was surprisingly a one coater. I absolutely didn't feel the need to add another layer! But habits do die hard, I still used 2 coats of base coat for very pigmented colors for additional protection to staining. For the design, I used white acrylic paint and and a detailing nail art brush to hand paint the ghosts, the not so spooky ghosts on all my nails. Painting designs randomly has been a staple in a lot of my nail designs. This nail art is one of them. I drew the ghosts at random places on each nail just to make it more interesting. And to give that effect that the ghosts are coming out from all sides. The white dots on the eyes are optional. I think the ghosts would look great with just black eyes. Or perhaps add a red dot instead of white for a more spooky effect. If you'd like to recreate this, try to experiment to make this nail art your own. 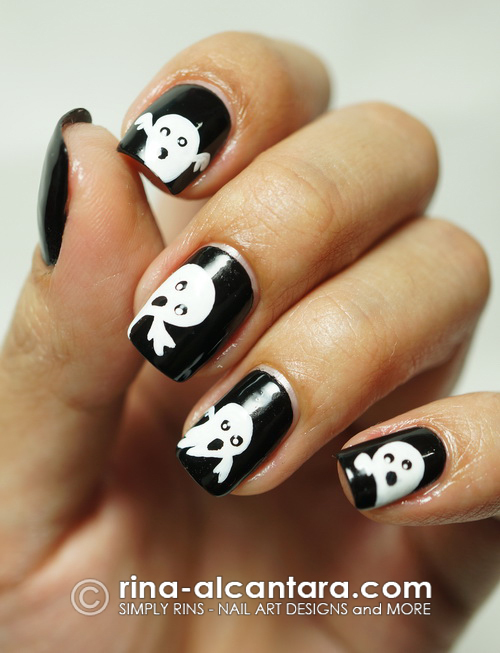 You may view more of my Halloween nail art designs here. Aww! I love ghosts like this, so cute! I'm a digital marketing researcher and I've been doing some research on various Filipino blogs and websites. Just wanted to let you know that your blog's online presence is stellar compared to other blogs and websites. very, very cute! not spooky at all. i recently discovered your blog through blog hopping and i'm very happy i did. very happy to see a Pinay nail artist too. i'm a noob when it comes to nail art and you're one of the few nail artists i admire. will also try to remake your designs for practice :) i have a loooong way to go. How cute and spooky at the same time.